Melbourne trio Children Collide are heading out on the road to celebrate their new single ‘Loveless’, which is set to hit radio from Monday. 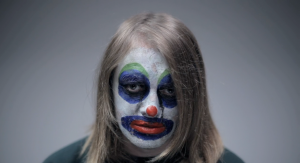 The band’s “most personal song” to date is lifted from their recent album ‘Theory Of Everything’ and it’s also been blessed with a new video clip that features lead singer John dressed as a clown (pictured). We’re scared of clowns. Thankfully, however, this clown can sing. So that kinda makes it alright. Check it out HERE. Anyway, back to the tour… The boys will kick things off in Frankston on Wednesday August 03 before visiting all but the ACT and Queensland (they’re on the Splendour bill, see…) in a twelve date romp around the nation. Tickets are on sale this Thursday.